Why Choose The Kitesurf Centre – BKSA and BSUPA National Training Centre? There are several kite schools in England as I’m sure you’re aware, all of them believe their school is the best! We of course are no different, but why not convince yourselves by reading through what we have to offer over other kite schools. Premises– We are the only school at Camber Sands to have an established centre located on the beach. We have on-site classrooms protected from the elements, changing rooms, safe storage, free parking, shop and all equipment readily available which is a massive advantage. Avoid travelling long distances, getting changed in cold car parks and learning theory out of the boot of a vehicle – learn in comfort. BKSA National Training Centre – A step up from a standard BKSA recognised school and one of just 3 centres in the UK, proving our school is safe with fully operational equipment and we are able to coach to the highest level. Safety conscious – Safety is our primary concern closely followed by having fun! We have comprehensive SOP’s and risk assessments updated regularly. All equipment is inspected daily and every instructor carries radios, whistles and safety knives. We also have safety boats, an ASAP rescue electric powered rescue board and a safety kayak – enabling our instructors to choose the fastest option to get to you on the day should they ever need to. 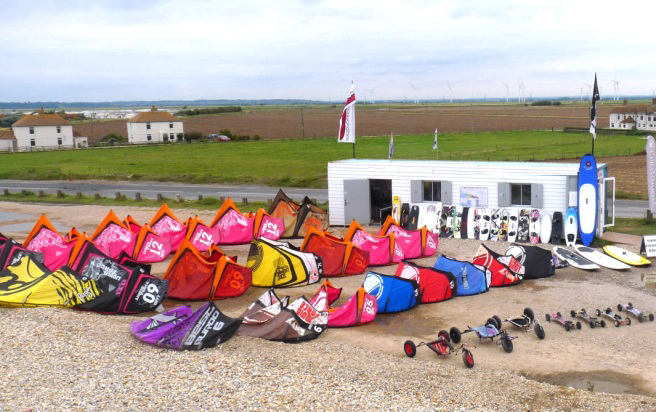 East Sussex & Rother District Council licence – The Kitesurf Centre is the only school in the UK with a teaching licence for Camber Sands beach and also a dedicated teaching zone away from the crowds. Unrivalled Experience – Our school probably has the most experienced and highly trained team in the UK. Most are Senior Instructors or coaches and have worked for and run several other schools and centres worldwide. 2-Way Radios – During our private tuition lessons, our instructors use two-way radios, enabling them to give you tips and tricks without you having to kite back to them. The radios are a great way for you to feel like you’ve got an instructor right next to you throughout the entire lesson, perfect for that first long ride that takes you 50m+ downwind! Best wind conditions – Being located on a peninsular offers the best wind stats in the summer months of any beach on the south or east coasts. Along with incredible sea / thermal breezes and local effects we rarely have to cancel and re-schedule. Best Beaches for any wind direction – Unlike anywhere else on the south coast, we have two amazing beaches within 10 minutes of each other but facing in different directions – Camber Sands and Greatstone / Littlestone. These allow us to run lessons no matter which angle the wind is coming from. Local knowledge– Prior to teaching kitesurfing, several of our instructors were beach life guards at Camber. This combined experience allows us to read the conditions to decide which areas offer the best conditions or even use a couple of local ‘secret spots’. Fully operational abundance of brand new kit – We have loads of kit from XXS to XXXL and anything in between which we upgrade every 6-8 weeks. We also use warm thick wetsuits. Hire equipment- We offer all of the kitesurfing equipment, as well as wetsuits, harnesses, buoyancy aid and helmets to those who have completed kitesurfing courses. Full length courses– Lessons sometimes overrun, so rather than finishing after the advertised duration has elapsed, we make sure the lessons are fully completed. Courses to suit you – We run loads of courses but if you feel there isn’t a course for you on our menu, give us a call and we will set it up! Multi Lingual – We’re able to teach in various different languages, including Polish, French, Italian, Swedish, Russian, Lithuanian, German, Arabic and Spanish. Local accomodation and entertainment for the family – The local area is renowned for tourists and entertainment / accommodation is in abundance for any age. Rye Tourism offers a large selection for the whole area. Easy access – Camber Sands is the closest kitesurfing beach to Central London just 40 miles south and easily accessible by train, car, London Liftshares or even bus. The car park is free. Group and student discounts – We offer discounts for students and groups of 4 people and over, please contact us for details. Most competitive pricing – Price match, if you find a better price for the equivalent lesson, we will match it. Post lesson equipment discounts – If you want to continue the sport and buy some of your own kit, we offer huge discounts for our students.